House of Mutt Blog » Does Size Matter? I love it when dogs exceed my (already very high) expectations. A case in point: we have staying with us at the moment a couple of Old English Sheepdogs. They are lovely natured, but huge. And don’t seem to tread particularly lightly upon this earth of ours: the carpets are shuddering, the kitchen door has a paw mark on it like the scraped remnants of tall teenager’s height chart, and I’ve given up mopping dry the area round the hallway water bowl. So when it came to introducing them to Jaques, our latest addition to the House of Mutt packlet, I was very mindful of the fact that he is a Miniature Dachshund, and They Are Not. I knew they would all be friendly, but I didn’t want Jaques to feel daunted by their sheer size. So I hovered over the standard House of Mutt ‘introduction process’ in hawk-eyed close protection mode like Royal bodyguard (which, thinking about it, is an image His Majesty J would probably enjoy!). But I didn’t need to have worried: a quick sniff and the OESs considered their perfunctory hellos done. J, a long-term visitor who knows the one-at-a-time introduction process well, as always approached the whole thing with a wag and that lovely ability of lovely dogs to always assume the next dog along is even more of a friend that the last. No nerves, no backing off, no stress. Good. He’ll still get special small dog treatment obviously: he’ll have his seat to himself in the car (Shhhh, no arguing: small dog, front seat in the Landrover. It’s the family rule! ), will only be allowed to go a fraction of their distance on walks, and will get first dabs on the garden door first thing in the morning – but it’s easy for me to do that bit of worrying for him, happy in the knowledge that he’s not doing any worrying for himself. And it set me off thinking about this size question. 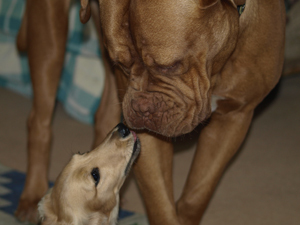 It’s quite common for people to say that their (usually small) dogs are frightened of big dogs. I am quite sure that that can be the case and that there’s not much as scary as a big out-of-control blunderbuss of a dog hurtling towards you in a park when you’re a feisty 5’10″, so who can imagine for a demure 10″. But are they, I wonder, reacting to the bad energy of the dog as opposed to its size. And is the size question then just made into a fear by us owners? We are lucky here in that the dogs are all good natured and well exercised so tend to be under pretty good control of themselves. Under those conditions and left to their own devices I have to say that it is incredibly common here for tiny dogs and great big behemoths to form really close bonds. So much so that if we have a XS and a XL here at the same time I’ve come to expect them to pal up. Maybe the different physical and mental confidences of the two compensate for each other and marry up well. I’m generalising of course. But I find it interesting. So witter about it here in case others do too. Size, I reckon, doesn’t matter in the slightest to dogs left to their own devices. It’s vibe that counts. And dogs know even better than us ‘umans that vibe can come wrapped in any sized parcel!